Purchasing a home is one of the biggest considerations and investments you’ll make. To help you gain more security in your decision, our partners at HSA Home Warranty recommend asking the seller to include an HSASM Home Warranty in the purchase agreement, or purchasing this valuable protection yourself. What are the benefits of a home warranty for buyers? Security and protection. Moving involves a great deal of time and expense. A home warranty will give you confidence during this process, and beyond that any repairs of a covered appliance or system will be handled by a qualified service professional. Reliable service 24/7. There’s no need to research different vendors for repair or replacement assistance. HSA Home Warranty is available 24 hours a day, 7 days a week, to help you schedule a diagnosis with one of their many qualified service professionals. HSA believes in offering convenience combined with quality service. Valuable coverage is renewable annually. Trusted service and valuable protection aren’t the only ways HSA helps make your life easier. 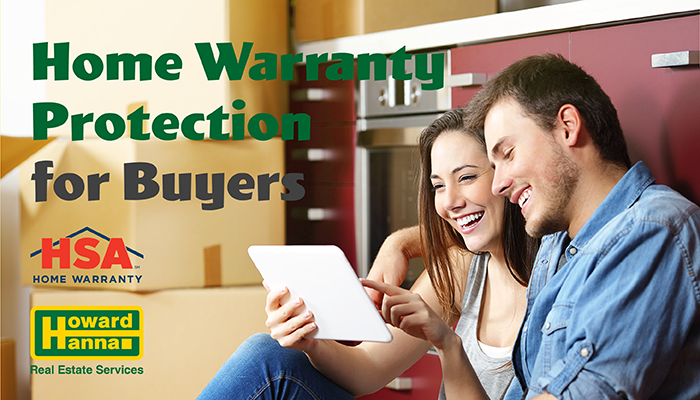 Their warranty is also renewable annually, so your appliances and home systems can receive continuous coverage. With a home warranty plan from HSA, you’ll receive a one-year service contract to help protect your budget from costly, unexpected covered repairs or the replacement of appliances and major components of mechanical systems that break down from normal wear and tear. At Howard Hanna Real Estate Services, our goal is to help you make Home Happen Here. With our one-stop shopping, we offer real estate services, mortgage services, title and escrow services, and insurance services, taking the worry out of moving by guiding you through your entire home buying or selling experience. In addition, our partnership with HSA Home Warranty helps us provide you with the peace of mind that your home is protected, from top to bottom. Ask your Howard Hanna Real Estate Services professional for more information about the benefits of an HSA Home Warranty when selling or buying your home, and learn more about an HSA Home Warranty by visiting www.HowardHanna.com/HSA-Home-Warranty!